Indians pitcher Trevor Bauer rises to lead Box-Toppers weekly player rankings report, passing last week’s leader Cody Bellinger of the Dodgers. 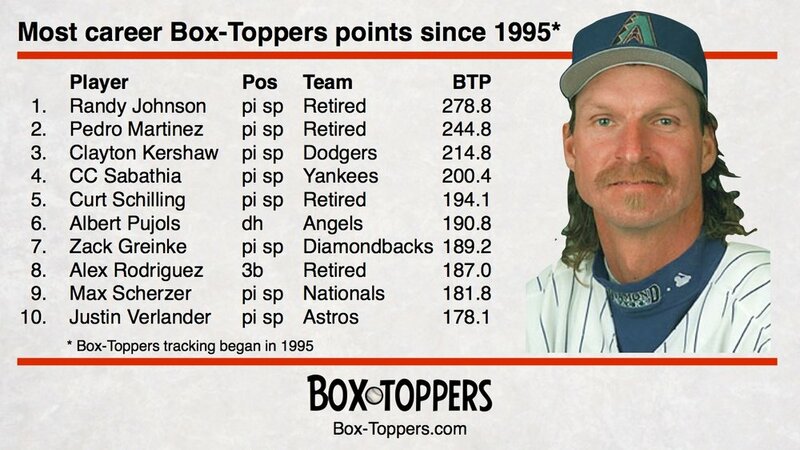 Meanwhile, Bellinger continues to lead National League players in Box-Toppers points, ranking second overall. Cody Bellinger of the Dodgers leads Box-Toppers first weekly player rankings report after two weeks of the 2019 season. Meanwhile, Brewers closing pitcher Josh Hader leads National League players and ranks fourth overall. Nationals pitcher Stephen Strasburg is Thursday’s Box-Toppers Player of the Day. Also Thursday, Indians pitcher Trevor Bauer rises to lead Box-Toppers season player rankings after earning American League Player of the Day honors. Here is a detailed look at Box-Toppers point leaders for 2018. The chart accompanying this post shows points leaders for the season by several different categories and classifications. 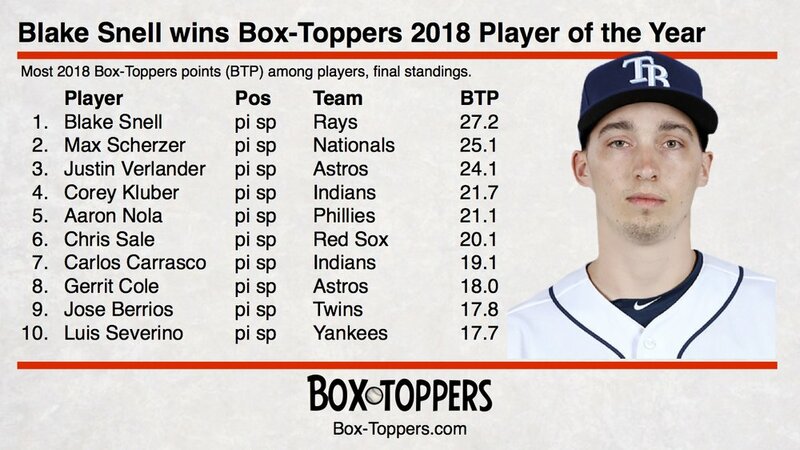 Rays pitcher Blake Snell is Box-Toppers 2018 Player of the Year. Snell, with 27.2 Box-Toppers points in 2018, finishes first in Box-Toppers season player rankings, ahead of second-place player, Nationals pitcher Max Scherzer (25.1). Meanwhile, Christian Yelich of the Brewers rises to first place among National League batters in Box-Toppers points this week, as the regular season comes to a close. Rays pitcher Blake Snell took the lead this week in Box-Toppers season player rankings, passing previous leader, Nationals pitcher Max Scherzer. Meanwhile, Ronald Acuna Jr. of the Braves rises to lead National League batters in Box-Toppers points this week. However, Rays pitcher Blake Snell, in second overall, has closed in to within 1.0 point of Scherzer. Snell leads American League players in Box-Toppers points. Scherzer still leads NL pitchers. Chris Sale of the Red Sox still leads American League pitchers. J.D. Martinez of the Red Sox still leads AL batters. David Peralta of the Diamondbacks still leads NL batters. 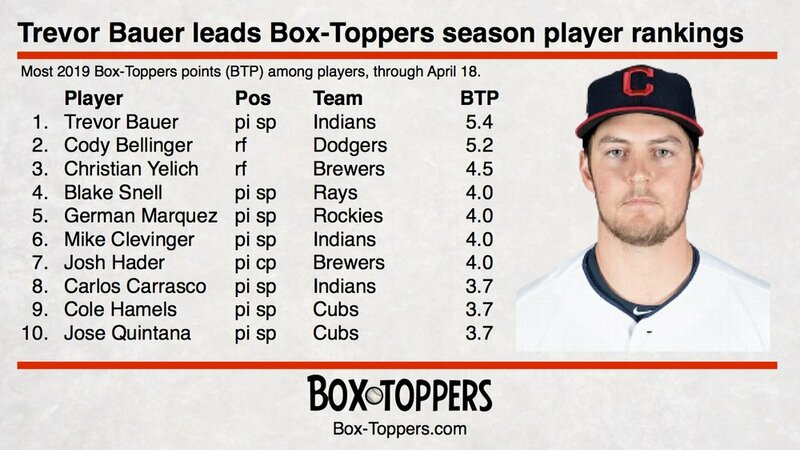 Nationals pitcher Max Scherzer maintained top spot in Box-Toppers season player rankings this week. Meanwhile, David Peralta of the Diamondbacks is the new leader this week among National League batters in 2018 Box-Toppers points. Leaders in all other categories remain the same. Nationals pitcher Max Scherzer maintains his lead in Box-Toppers season player rankings for the third straight week. Scherzer has 20.1 Box-Toppers points, holding a narrow lead over second-place player, Red Sox pitcher Chris Sale (19.1 points).